Baby brother Jay celebrated a big birthday milestone over the weekend. He turned 30!! Can you believe the baby of the bunch is 30? To celebrate we did what everyone does on their 30th birthday...we had spaghetti dinner and then we went roller skating! Jay's best friends and their families along with our crazy family met at Hot Wheels and we had ourselves a fun time celebrating Jay. Jordyn didn't join us since she was recovering from a stomach bug so she stayed home with Pop. No better place for a maternity shoot than a skating rink. The airbrushed Nascar on the wall made the perfect back drop. What a difference a year makes. Last year at this time these two goobers got engaged. Now they are an old married couple and getting ready for little baby Carter! 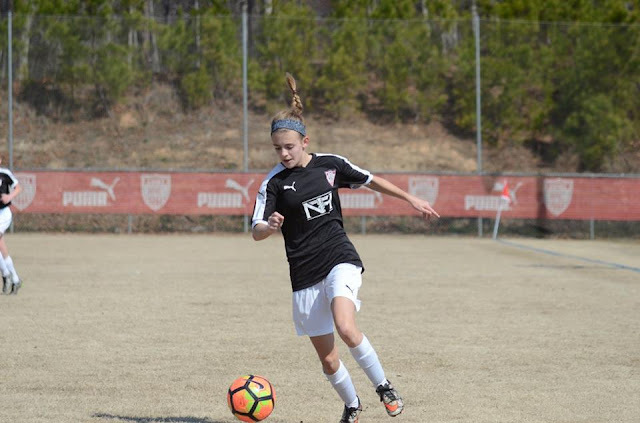 The weekend also brought the official start of spring soccer season. This means lots of soccer pictures for the next 3 months! First up Bryce had a game bright and early on Saturday. It was our only game of the day so that was a treat. The boys played hard, but they came away with a loss. Bryce got his fingertips on this ball and deflected it, but the other team ended up scoring on the rebound. Those are hard to save! On Sunday we had 4 games on the schedule. First up was Sydney for her season opener. It was a great game, but the girls lost. They were by far the better team and no that's not a mom with rose colored glasses talking. They really were the stronger team. One of the goals the other team scored was on a missed off sides call. Missed calls are more common than we would like unfortunately. Despite the loss the girls played so good and hopefully they will not let the outcome of this game define their season. Jordyn's game was next, but I wasn't able to watch it since Bryce had two games out in Duluth. So while we drove to Duluth, Bryan stayed with the girls to watch Jordyn's game. Since Jordyn hadn't been feeling well she didn't play much. No pictures from this game. After sitting in some traffic Bryce and I made it out to Duluth for his games. Since there are so many boys on Bryce's team they divide the boys up and play multiple games sometimes. Bryce was rostered for two of the three games the team was scheduled to play. The boys lost the first game and won the second. 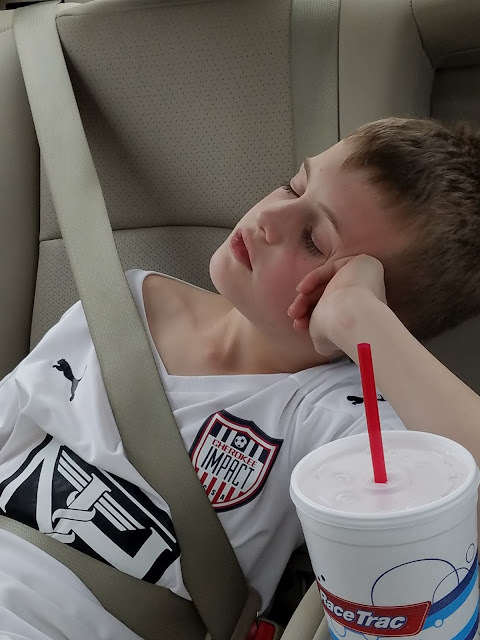 And this is what two soccer games in a row will do to a guy on the drive home.